Last week we were in the Ottawa area, working on a side project that I’ll talk about in a few days. 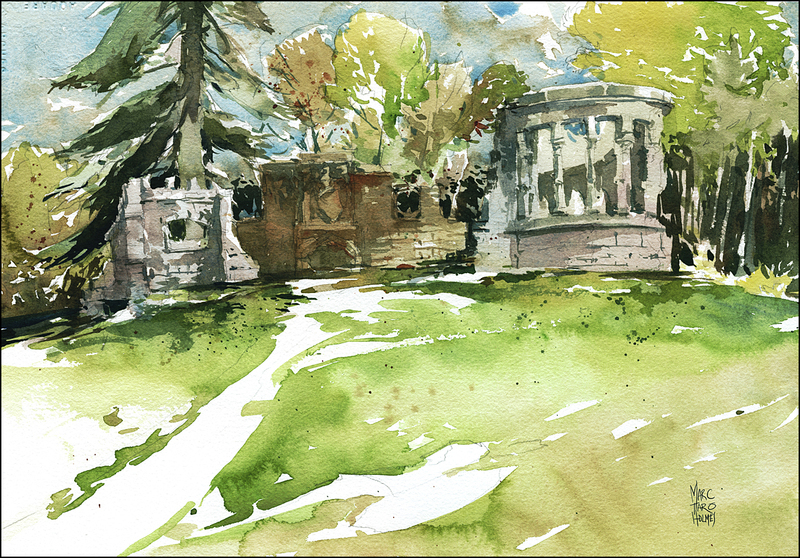 Fortunately, there was time for a day drawing with John Wright, fellow Urban Sketcher, and all around great guy. 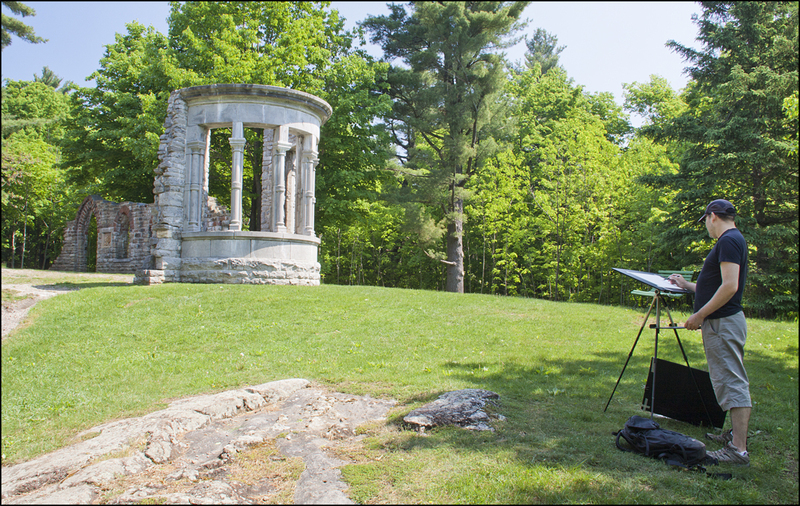 John took us up to the Mackenzie King Estate in Gatineau park. I was not aware of the personal details of Mr William Lyon Mackenzie King and his sweeping influence on Canada. Besides accomplishing a lot of nation building, he had some other strange ideas. Such as consulting the spirits about policy, being overly dedicated to his mom, and supporting Hitler (but not Nazi’s. Some kind of fine line going on there). Whatever! I gather the guy was no friend to my Japanese immigrant ancestors, so I’m not looking into this in any great detail. But, he did leave us a national heritage embodied in the federal buildings in Ottawa, and on the grounds of his country estate, Moorside. Apparently his friends would send our quirky PM chunks of ruined architecture to install as architectural follies. It gives the whole place a romantic Edwardian feeling. There are three major installations, one of which would look especially amazing in the Ontario fall colors. As we painted the reconstructed walls they call The Abbey, a family came by to conduct a memorial scattering of ashes. They asked us not to stop drawing, just to carry on as if they weren’t there. There were some solemn moments with a few nice words about the deceased and a friend of his playing the bagpipes. It certainly added a strange melancholy mood to an otherwise high-key spring painting. It was an intensely Canadian feeling. 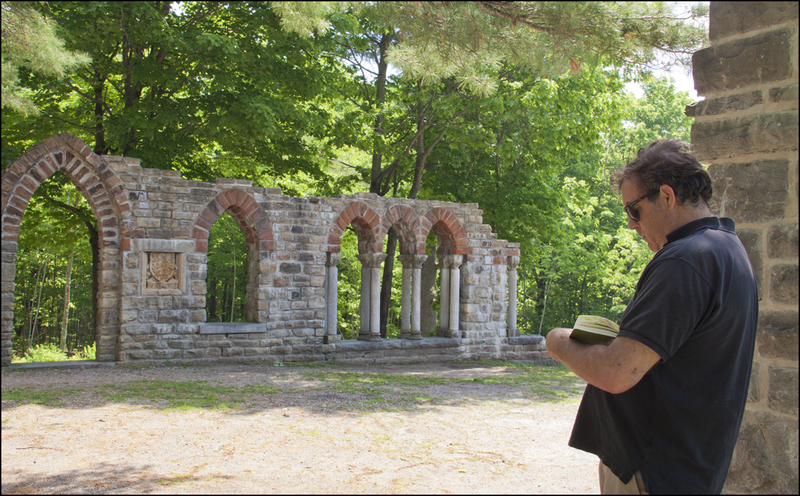 Bagpipes, stoicism and Mackenzie’s crazy ruins. These are the kinds of things that happen painting out in the real world. Thanks for this. I am trying to learn to paint watercolor myself, and had I tried to paint this scene I probably would have tried to paint EVERYTHING. You let the white of the paper do a lot of the work. It’s a great lesson and reminder that ‘less is more’ with this medium. Aie! Um thanks I think :) I hope you can manage it long before that day! Great painting and story, Marc. If you want an entertaining perspective on Mackenzie King’s legacy, read Joshua Then and Now, by Mordecai Richler. It’s brilliant. I look forward to your next post.